« Cowl Girl Knits Party! I know, I know, cowl crazy right? There are just so many promising yarn combinations, colour combinations, and patterns to choose from! The best thing about a trunk show is seeing the finished garments IN PERSON. A photo is great but there’s nothing better than trying something on. This doesn’t mean that mine will turn out exactly the same, especially as I freely substitute yarns, but it does offer some great inspiration. Amanda, Kynna, and Anina have been cowling (just made that word up, I think it’s a keeper) away and here are a 2 of their FO’s from Cowl Girl Knits. 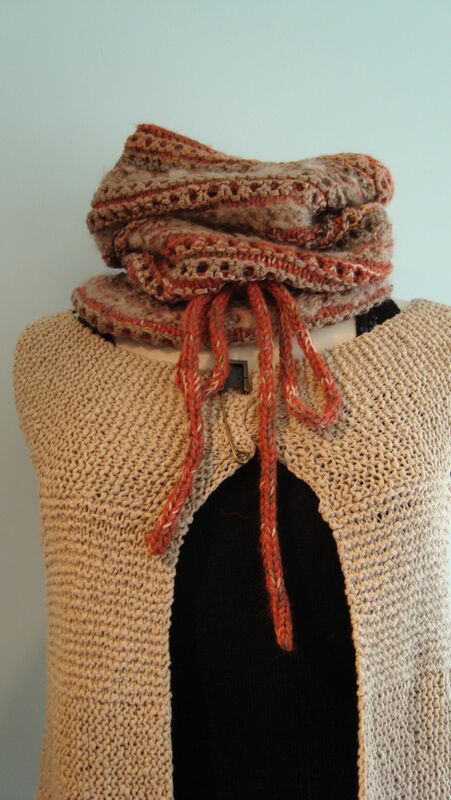 Amanda’s Eyelet Cowl: This cowl was made with Mirasol Qina, Tilli Tomas Mega Skein, and Alchemy Juniper. This is quite the beautiful yarn cocktail! 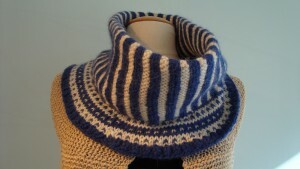 Tilli Tomas is always a knitters little luxury, the colours are stunning with just a slight variegation. The Qina is a super soft yarn, my daughter has a whole sweater in it and it’s warm and wonderful. The Alchemy Juniper is one of my latest obsessions, it’s soft and stretchy and Alchemy’s colour pallette is the stuff dreams are made of. I’ll be picking up a couple of skeins for some luxurios socks tomorrow! Kynna’s High Contrast: Kynna knit this little beauty up in Luxury Alpaca. The key to making this cowl really work is (as the name suggests) the contrast between colours. If you were to use colours that were closer together in shade or intensity it just wouldn’t have the same effect. Choose wisely! The original pattern calls for the Classic Elite Ariosa, which we do carry in some beautiful colours, but having felt Kynna’s cowl, I think I would make mine in the alpaca too! This entry was posted on Thursday, February 24th, 2011 at 6:38 pm	and is filed under Uncategorized. You can follow any responses to this entry through the RSS 2.0 feed. Both comments and pings are currently closed.